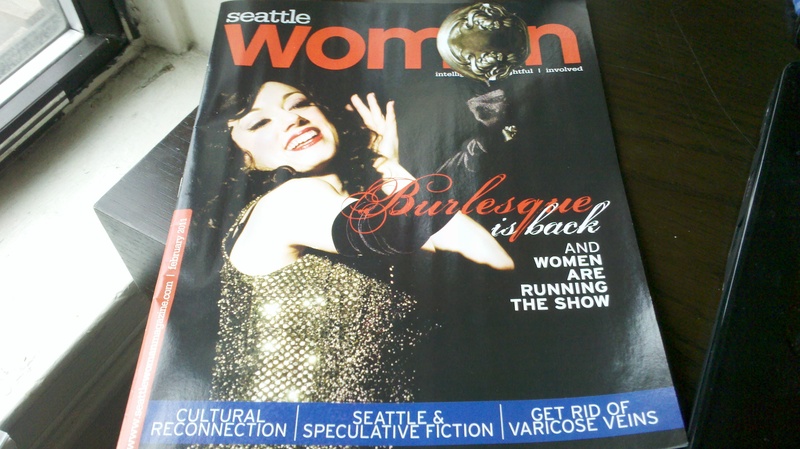 Burlesque continues to land in the media- this week Polly Wood has popped up on the cover of Seattle Woman’s February issue. The magazine can be found downtown and should be available for reading online in a few days. The feature mentions Seattle’s pioneering ladies Indigo Blue, Tamara the Trapeze Lady, and Paula The Swedish Housewife, as well as insight from Trixie Lane. Sydni Deveraux and Evilyn Sin Claire are pictured in photos by Greg Holloway. As a side note, I love that not only is the title “Burlesque is Back: and Women Are Running the Show” but there’s a feature below titled “Get Rid of Varicose Veins”. How very utilitarian! In other news, follow this link to listen to a great interview from NPR yesterday with Karen Abbott, author of American Rose. Honeysuckle Hype, “West Coast burlesque producer and performer who performs as your average food-obsessed 1950s Lesbian housewife”, is also a featured guest. ~ by angrytruffle on 01/27/2011.